The reasons are obvious. It turns out that even the Big Four Chinese banks have been complying with Western sanctions, although Beijing officially condemns the sanctions. 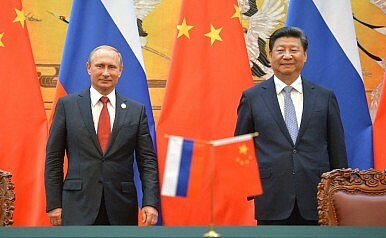 Given the choice between the opportunity to increase their presence in Russia’s high-risk market (previously small and now even more shriveled with GDP in constant decline) and the potential to strengthen their positions in the huge and stable markets of the United States and the EU, Chinese banks are opting for the latter. A “strategic partnership” does not rule out financial judiciousness. And in some cases, like that of Turkmenistan, Russia’s losses have been China’s gains. Over the past few years, trade of Turkmen gas to Russia (for resale to Europe) has dried up. In January, Gazprom announced it would stop buying from Turkmenistan altogether after the trade had already plummeted from a high of 40 billion cubic meters of gas in 2008 to 4 bcm in 2015. Meanwhile, Turkmenistan shifted exports to China. In the first three months of 2016 alone, Turkmenistan supplied China with 10.6 bcm of gas–a 33 percent increase over the same period in 2015. The Central Asia-China pipeline already has three operational lines and a fourth is under construction which will increase capacity to 85 bcm per year. For sake of argument, consider how Russia’s Asia pivot has differed from the United States’ pivot (excuse me, rebalance) to Asia. As Shannon Tiezzi and I argued in a recent article for FiveThirtyEight, one of core aspects of the U.S. pivot was simply showing up in Asia. Much of the United States’ increased involvement in the region focused on participating in multilateral forums which many Asian powers prioritize as venues to build consensus and conduct diplomacy. At the same time, bilateral interactions with China have also received increased attention. Putin is famous for disliking multilateral events and only attending them for the sake of one-on-one meetings. But Putin’s snub of APEC, where symbolic gestures are fundamental to policy and international relations, was interpreted to mean only one thing: Russia was not pivoting to Asia, it was pivoting to becoming China’s junior partner. In the end, Russia’s pivot to Asia will continue to underperform as long as the Russian economy is withered and its relations with Europe tense. That said, the two share a number of strategic interests and the failure of this pivot doesn’t necessarily undermine the political sympathy Beijing has for Moscow.